This year's commemorative dollar from the Royal Canadian Mint offers a bold, modern take on tradition through a symbolic image of Canada, which represents a confident nation on its 150th anniversary. Every intricately engraved element represents a different political, historic, geographic and social aspect that speaks of the country's history. Your coin is the 58th issue of the Royal Canadian Mint’s ever popular proof fine silver dollar coin. Continue the tradition and order your coin today! 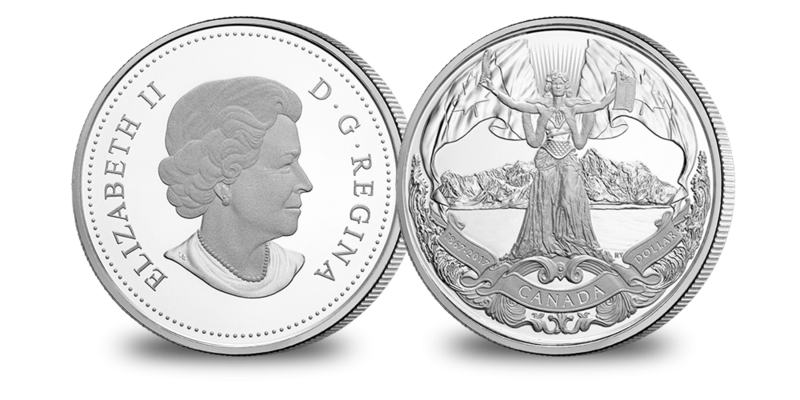 ...your coin features a contemporary take on a classic female allegory that personifies Canada on its 150th anniversary. It represents the story of Canada as a nation, all conveyed by the intricate engraving and careful use of multiple finishes. In the foreground, Canada rises up strong, majestic and bold; she bears a youthful appearance, given Canada's status as a relatively young nation. Canada is the picture of grace and a vision of strength in her protective armour; and yet, she carries no weapon—a symbolic nod to Canada's historic peacekeeping role, and our efforts to bring peace throughout the world. Her brow is wreathed with a glorious garland of poppies, much as the lyrics to O Canada affirm in French. Facing out as though looking to the future, Canada's gaze is calm and steady while her arms are open wide, ready to embrace what challenges and triumphs lie ahead. In one hand is a symbolic representation of the British North America Act, which represents the birth of the Dominion of Canada 150 years ago; in the other hand is a single feather that pays tribute to those who helped forge our nation's path: the First Nations peoples and the Fathers of Confederation. A fur cape is a further reminder of First Nations traditions, as well as the importance of the fur trade in Canada's early history. Thirteen rays of light—one for each province and territory—shine down upon Canada, while the waves at her feet represent the oceans that surround us. The Canadian banners link air, land and sea while in the background, Mount Logan (Canada's tallest peak) represents the diversity of the land, and alludes to the ability of Canadians to "rise" to the challenges we face—yesterday, today and in the future. The image is struck against a brilliant field as many as three times to achieve a crisp impression with outstanding detail. Special dies are hand polished and frequently replaced to maintain absolute perfection. Struck to commemorate the 150th anniversary of Canada. The proof dollar is one of the most sought-after coins issued by the Royal Canadian Mint. Rich in symbolism, every element of the design is representative of Canada as a nation.